V and Co.: GIVEAWAY GIVEAWAY GIVEAWAY! First one?? Really?? Wow. Anyway, I have been loving her 4 dates necklace (though I only need 2 or 3)...but really it is all such great eye candy! DON'T KNOW IS THIS WENT THROUGH THE FIRST TIME. I REALLY LIKE THE PERFECT PEARL NECKLACE AND THE ONE TEAR NECKLACE. IT IS HARD TO CHOOSE JUST A COUPLE. I like the Family tree one you picture here, and I also really like the Dream Angel necklace in her store. Gorgeous stuff! I love the Blessing one, but my favorite is the pink brooch with the single pearl in the middle. That is beautiful. Hope I win the giveaway. Everything was so nice. my favourite is actualy the blessing one. 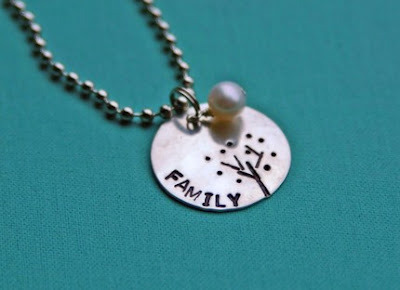 I actually love the Family Tree necklace - although she has tons of cute stuff. It's really hard to choose just one! "BLESSED" would have to be the one for me. Considering that the hubs and I fought to be the parents of our adopted son for nine months, with some moments we thought we'd lose him for sure, I think that BLESSED speaks to me the most. I love those cherry bomb earrings. Still jealous of your shoes too. I love red! She has beautiful things. I love the moody blues and the thankful necklaces. Thanks for the great Monday morning pick-me-up! I love the Great Debate earrings. She has some very nice wares. Thanks for the giveaway. Just darling! I really like the "faith", "blessed" and "family" jewelry! Such pretty items! I really like the Thankful necklace because I do feel thankful for what I have in my life. I also like the Tropicana earrings. It's hard to choose - they're all nice! Thanks for the chance to win. I actually love the blessed necklace. I would also LOVE one with my kiddos names on it. What a great giveaway! YIPEE! I love the Great Debate earrings. They are simply awesome! I love the "One Last Sunset" earrings. Beautiful! My favorite are the Great Debate Earrings! They are so classy! Oh, everything is cute. But the Fruit Punch earrings are my favorite- so pretty! So hard to pick a favorite. I think the 4 dates is fabulous but I love the Blessed necklace. There was another one too, I think it said Chic for my grown up dates. I love the 4 Dates necklace. But as a second one, Cocktail Therapy. I love the family one. Really love the pearls too! She has a lot of great things....I love the perfect pearl necklace! Thanks for a great giveaway! i love those cotillion earrings! thanks for a great giveaway!!! Love the earrings and the pearl necklace!! So fun! 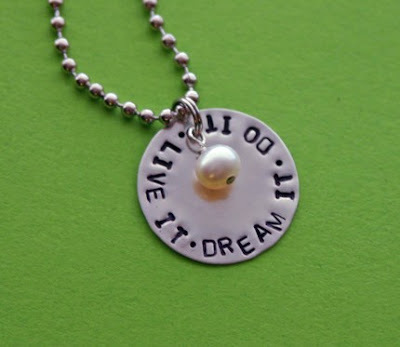 I think that the LIVE IT DREAM IT DO IT necklace would be an absolute perfect graduation present for s recent graduate. I also love the thankful necklace. In these tough economic times its easy to forget how thankful we should be that we have so much. I have alink on my blog to your site also. I just love it! ooh - the One Last Sunset earrings are divine - I love the aqua and red combo. I love the live it dream it do it one, I think it would be perfect for a friend who just completed her first triathlon! OMG how beautiful are her designs!! I am in love with the Moonflower earrings! Wow! She is so talented! I really think I love the 'Rose Drop' earrings, I really love pink. Thanks for the fun giveaway and all the inspiration. What a great Etsy Shop! It was so hard to pick what I loved most ... her flower brooches sure are chic, as are her beaded necklaces, but I'm currently a little obsessed with silver disc stamped necklaces, so I have to say her FAMILY TREE necklace is my favorite right now, though BLOOM was a close second. 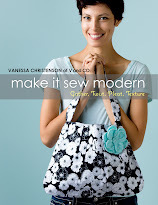 Fabulous Esty site! Thanks for highlighting it. I loved the Cotillion earings. I also can hardly resist the One Tear necklace and the Sedona brooch. I will probably be ordering something. I love the One Tear necklace! What a great give away. Thanks for the chance!! That One Tear necklace is just beautiful! It's hard to choose-I like so many. I love the Bloom necklace-would be great for a gift for a preteen/teenager. I love the four dates necklace...though I'd only use three....love all her jewelry...very pretty! I love the blessed necklace as well as the awesome red earrings you talked about! I love the Fresh Squeezed necklace! Great colors! What beautiful, fresh and original pieces! I love the Blessed necklace or the Pray necklace and earrings (if you REALLY must make me choose LOL). I'm a sucker for anything written in French, so the Je t'aime necklace just makes me happy. Hi again, Vanessa. Just popping back to tell you I've promoted your giveaway on my blog. Looking forward to the draw!! I snatched up my favorite: Circle of Love earings. They are pink no less! :-) But my second favorite is the ice drop earrings! AND SERIOUSLY how clever is the earrring of the month club. Perfect idea for my hard to buy for MIL! I have to say that I love all of her creations...but my TWO favorite...sorry couldn't narrow it down to one...would have to be the "Family Tree" necklace and the "Cotillion earrings"...and I do the the "Cherry Bomb" earrings you love too!!!!! Very tough to choose just one but I really like the chunk of red necklace! I love the round silver necklaces, but my favorite is the Live it, Dream it, Do it one. I also like the flower in the little girls hair. My little girl would love that. I love the custom name necklace, but honestly i think i would still choose the blessed one. it just says it all!! =) so beautiful and simple! i love it!!! I love the 4 dates necklace and the blessed necklace. Both are adorable. THanks for introducing me to her shop - I haven't seen it before. The JE T'AIME would wow my 16 year old. She's SO into anything french! Great shop ... thanks for the info. I believe I may just need to blog about it! Wow. It's 8am and already you have over 60 comments! People love this stuff, eh? Everything is so great! I LOVE the starry nights necklace. I have the perfect outfit to go with it! The Live It, Dream It, Do It for me! I love the so chic bracelet, but it was very hard to choose between so much beautiful stuff! Love EVERYTHING!! I really love the SO CHIC bracelet. ( really love the "Joy" necklace that she made! (I am not sure that it is still in the shop, but she in on my reader list...). My daughter's middle name is Joy, and i love the word and all that it means... I just adore her stuff anyway, though! Thanks for sharing this etsy shop with us. My favorite is the Dream necklace with the butterfly. Neat stuff!!! I love all the Joy, faith, blessed necklaces! Pick me, pick me! I love that blessed neclace- love it. I also love the Angel Dream! I am in love with the Iced Cranberry Earrings!! And actually really really like the blessed necklace! I love the SO CHIC bracelet. Very Classy! I love the vitamin c hair flower. My daughter is almost 2 and still hardly has any hair so I always use hair clips so people know she is a girl! I'll tug on your heartstrings a bit and tell you she had a brain tumor removed on March 2nd of this year so she had a bunch of hair cut off...gotta love the big hair clips! I love all here jewelry!! I would probably choose her Iced Cranberry Earrings as my favorite...or her custom named necklace...I don't know. She's so talented!! I would love any of the hand-stamped necklaces with words like joy or faith! I LOVE most of page three but my absolute fav has to be the Crush necklace. I love the color combo of the gray/black and the pink. A very close second (very hard to choose between these two) is the Moody Blues set. So please enter me in your giveaway. I would love to win one of those. I also linked to my blog! That family tree necklace is so simple and cute. Love it. LOVE the Perfect Pearl Necklace! So beautiful! Everything is beautiful, but I truly love the blessed necklace! Ooooh. The moonflower earrings are super cute! The Blessed necklace is GREAT, I am also drawn to her Thankful necklace! I am both Blessed and Thankful! Tough choice. I love the blessed one that she's giving away. But I also like the joy one or the 4 dates one. Too cute! I love all her jewelry- but live it love it do it- is such a fun saying! Thanks for introducing us to a great etsy store! My favorite is probably the moody blues necklace and earrings. But it's all beautiful! My favorite is the SO CHIC bracelet. Gorgeous! I love that Blessed Necklace. It's simple and just plain awesome! I'm a mommy so the family necklace is what calls to my heart! I love the Live It, Dream It, Do It necklace and the Family one, I can't pick just one. either the family tree one or the vitamin c hair flower...that color rocks! thanks for introducing me to another cool etsy shop! I love the Family Tree necklace. But the Blessed one is great too. You are right, she does have some amazing things! I can't decide between the "live it, dream it, do it" and the family tree necklace. Love them! My favorite thing IS the blessed neckalce - while it's all beautiful, the blessed necklace speaks to me the most and reminds me what I have in my life to be so thankful for. I love the "float" necklace! What great stuff! I'm now off the the bead store with my great inspirations! I love the "live it, dream it, do it' necklace. i sent it too my hubby with a big hint on it. Think he'll get it. I love the Family necklace and the 4 dates, what a great idea to show off your kids Birthday, I love it!! her hair flowers are beautiful! I love the faith, joy and blessed necklaces. They make such a wonderful statement!! Love the fresh hair flower. Too cute. I love the perfect pearl necklace! Thanks for the great giveaway! hard to choose but this is cute! I think I actually like the BLESSED necklace best, though she does have so many beautiful pieces. What a nice giveaway! love the coral sticks earrings. they're the bomb! Love the cherry bomb earrings too! Wow, what great jewelry. I love the Great Debate earrings. I'm thinking of a particular outfit that they would look Fabulous with! If I had to choose just one it would be the '4 DATES necklace'. Love personalized jewelry...and ALL her stuff looks lovely. Just blogged about it! Crossing my fingers now! I loved the family tree necklace and rose drop ear rings. I love the love squared necklace. Thanks for the giveaway! I love her necklace and would love to get one with both of my kids name on it. My favorite is the "Family" necklace!! I am way into genealogy and I think it would be perfect! Thanks for the giveaway. I love the swapmeet interchangable necklace. Oh and the cocktail therapy necklace, those are so perfect! She does wonderful work, thanks for the link! I want a necklace that say my word of the year!! SOOOO CUTE! I love the so chic bracelet! Her BLOOM pendant is so perfect because it can have more than one meaning! I'd like an ivory pearl instead of the fushia though - it's lovely! the Float necklace made to 20in would be perfect with a pair of earrings I aready have. Cute stuff! My favorites were the Free Squeezed necklace or One Last sunset earrings. She has great stuff! I love the One Last Sunset earrings, and for sure the family tree necklace. Hope I win! I have two faves--one last sunset and chunk of red necklace. They are all so lovely! The 'Love Squared' is gorgeous, as is the 'Family tree'. Fingers crossed! OH who wouldn't love love love the Therapy neckless! Oh and the earring club is such a fabulous idea!! 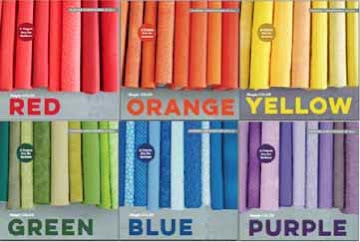 And of course I love the coral sticks... so many to choose from! I hope I win & I think I may just have to have some of these anyhow! I adore the 4DATES necklace! I would put my husband's birthdate, my birthdate, our wedding date, and my daughter's birthdate. Thanks for showing us this shop! It's now in my favorites. I think the 4 dates is great...I do love the blessed necklace though and it would make a great gift! She has so many lovely pieces. I have to say, though, that the Blessed one is my favorite. 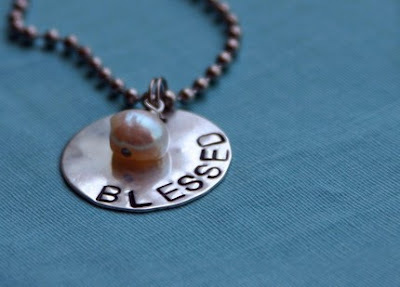 We have 7 children whom I call the Blessings... doesn't a Blessed necklace sound perfect?! The cherry bomb earings are the BOMB.com!! Love this giveaway!! I love the Four Dates necklace, but I liked almost everything I saw. One Last Sunset earrings and the Chunk of Red necklace!! LOVE EM! I love her things, but w/ the upcoming birth of my child the "faith" necklace touched me. With my moms passing, I have mixed emotions about this. All the necklace looks beautiful but I love more the necklace that had the little pearls on ..
Beki certainly does have some beautiful things. Pearls are my favorite and I'm quite taken by her stamped disc necklaces with the pearls. Amber Roberts - Such cute stuff!! Do I have to pick just one? I really do the the family tree necklace! I love the family tree necklace. One tear necklace & the perfect pearl necklace too - where would I wear those? Who knows, but maybe I'd have to get new outfits too. :) Thanks for sharing the etsy site! thank you so much for the giveaway, wow she had so many pretty things on her etsy shop, i love everything but my favorite is definitely the blessed necklace because if i was wearing it, whenever i have a rough moment i could just look down at the necklace and remember how truly blessed i am. My favorite is the "blessed" necklace. Just beautiful! i love love love the one last sunset earlings i love the blue and red together I also love all teh stamped silver stuff i want to get into that. OH MY! It's had to choose, but definitely have to go with the Joy necklace because it's my middle name! LOVE IT! I love the Perfect Pearl necklace and the Blessed necklace. All of her things are so lovely! She has beautiful stuff! I love the "Blessed" necklace and "Je T'aime" necklace. The Great Debate earrings are also fab. I would like the earring of the month club, that is sooo cool! Does she make jewelery for 6 kids names? I love the "blessed" one too!!! LOVE the One Last Sunset earrings. My favorite color combo! 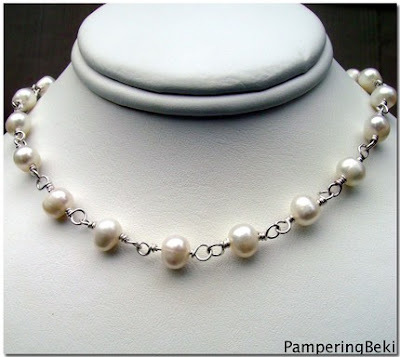 I LOVE LOVE LOVE the "perfect pearl necklace" - LOVE! IT! I am loving all her beautiful creations, but I think the Family Tree is my absolute favorite. I love the pearl neacklace. So dainty and timeless. Thanks! i love those hair flowers! Everything is great on her site! I love the Family Tree necklace! Eveything is so nice. I love the family tree one. But the Blessed one is so pretty too. I Loved the "So Chic" bracelet. I also added a link to my blog for the giveaway. My blog's private though, if you'd need to check it out, email me at courtneycurt@gmail.com and I'll email you back an invite to the blog. You are so creative, I LOVE your blog, and I love the link to the beautiful jewlery on her site. oh...love the THE GREAT DEBATE earrings. I love the red earrings, actually and I don't usually go for bright -my wardrobe is all brown, navy, and black. Maybe I should go for more color! I love the Joy necklace! but i think the 4 dates necklace is my favorite. Okay, I may be cheating but I COULDN'T pick just one!!! I like the teal float necklace and the red coral chunk earrings!! Super cute and sassy! I love the SEDONA brooch! The colors are fantastic! Can't make up my mind between the four dates necklace and the family tree necklace! Such adorable stuff! "Blessed." That pretty much describes me and labeling myself that way would be perfect. Thanks for the giveaway and a chance to win. Well, since JOY is my word for the year -- I would love that necklace. I have been to her stop before and i adore of course every thing but the LOVE SQUARED pendant is simply beautiful! I love GiveAways! Cant wait to see who wins and what they win! yay! I love the red earrings too! Thanks for the chance to win! I think my favorites are the Blessed necklace and the four dates (perfect for my four kids). I've never won a giveaway yet, so maybe I'll just have to buy it for myself. So cute! loved the je t'amie necklce...pretty much thought everything she did was beautiful. The moody blue necklace is very pretty but I like the stamped necklaces too, oh the choices! I love the perfect pearl necklace and the red earrings would look great on my friend whose birthday it is today. I love her Uptown girl brooch. I'm a sucker for anything with polka dots! Lovely necklaces and earrings. I would definitely choose the FAITH necklace b/c right now my close friend is going thru chemo and it reminds me of her. I would have to say I love the JOY necklace...but it was very hard to choose...it is all lovely! Oh my goodness! What gorgeous jewelry. I LOVE the Je t'aime necklace (I ♥ anything French) and the Moody Blue necklace and the May Flowers earrings and... Wow! It's all so beautiful! Only picking one might be close to impossible! I narrowed it down to 4, but that was the best I could do! haha Here they are: Iced Cranberry earrings, coral sticks earrings, rose drop earrings, thankful necklace. Thanks for introducing us to Beki, with all that beautiful stuff, I'm sure I'll be visiting her shop often! I adore the Family necklace. My boys are 15 and 19 and seem like they're gone more than they're home! It would neat to have a piece like this showing the importance of Family to me. Of course, the Blessed one would too!! Thanks for the opportunity - going to blog about it for sure! Hello again, Vanessa! I'm back after posting about your giveaway on my blog! Looks like there's lots of interest in this beautiful prize (and of course your beautiful blog)! What awesome jewelry! I really like the FAMILY TREE necklace. Blogged about it here as well! I love the Perfect Pearl necklace and Je T'Aime is so beautiful. 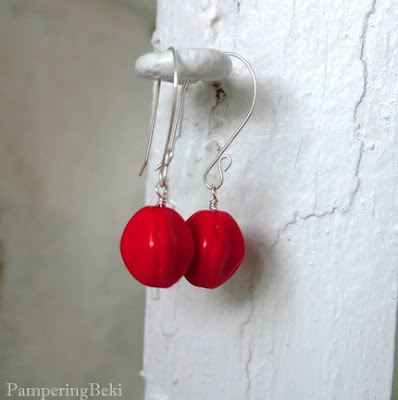 I am marking Beki as a favorite seller! She makes beautiful things! I blogged your awesome giveaway! Yay for an extra entry! there's NO WAY to choose just one...i love the dream pendant with the butterfly. all the flowers are gorgeuss (i wish i had a green thumb.) ahhh, pearls, need i say more?